Having a light source when backpacking or in an emergency situation can be a great comfort. It is even better if the light source is lightweight, solar powered and takes up relatively no space. Collapsible solar-powered lanterns are very versatile and can be used for many applications. With the advancement of LED technology, solar-powered lanterns have come a long way. LED lights are low power consumers, but output a lot of light. There is no need to plug in these lanterns because they can be charged using the built-in solar panels. Here are some to consider. The Mpowerd Luci Inflatable Solar Light offers a nice solution for any hiking or emergency solution. This lantern consists of 10 LED lights. When inflated, it produces enough light to illuminate your tent for reading a book. It has many practical applications such as patio, deck or garden lighting or a roadside emergency light. It has 3 settings very bright, bright and flash mode. When you’re done just deflate and store. The Mpowerd Luci Solar Light will be fully charged after 7 hours in the sun and will last 12 hours. This solar light weighs only 4.4 pounds, collapses down to a 1-inch profile and is completely waterproof. It also has a handy charge indicator that shows you how much charge is left. The TrekUltra Solar Anytime Light is a slim, compact solar-powered lantern that offers 12 hours of light between solar charging. This light also has 3 settings: low, high and flashing. It also has a built-in magnet allowing it to be secured to any metal object and includes a plastic strap for hanging. The TrekUltra Solar Anytime light is 5 inches and weighs only 2.5 oz. It is waterproof, making it great for outdoor applications. The SparkLED Folding Clover Solar Camping Lantern is a unique collapsible solar lantern, which is ideal for camping. It easily folds up allowing it to fit in a backpack. It has a hook for simple hanging. This folding solar-powered lantern has three solar panels for charging the internal batteries. This unit can also be charged using the USB port. The SparkLED offers 100 lumens of light. The ErgaLogik Compact Solar Camping Lantern is a handy collapsible solar lantern. It offers 10 hours of light between charges. 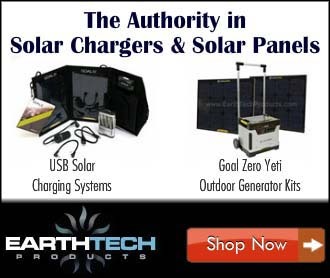 It can be charged with the solar panels or USB. This solar lantern is small enough to fit in your pocket and takes up minimum space in a backpack. This lantern is great for illuminating a campsite or outdoor area. It also makes an excellent emergency light source. Compact, lightweight and easy to use. All of these collapsible, lightweight and inflatable solar-powered lanterns offer a convenient way to have a renewable source of light. Solar powered lanterns are great for backpacking, camping or general outdoor use. These lights also work well in an emergency or survival kit.